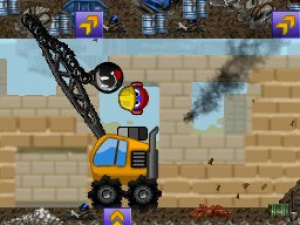 Magnetic Joe first became popular as a mobile game back in 2006, using its simplistic control scheme and colourful visuals to garner a fairly decent audience over the years. Now the game has come to Nintendo's DSiWare service, and it remains very similar to its original incarnation. However, the "ball rolling" experience has somewhat passed its prime in the last five years, the title now beginning to show its age. As with most ball rolling releases we've seen, Magnetic Joe challenges you to guide your round friend to the exit at the end of each level. Along the way, you'll have to use the many directional magnetisers that are strung throughout to guide him to safety. Each of these has its own unique arrow that points in the direction that the magnetic current will push or pull Joe. 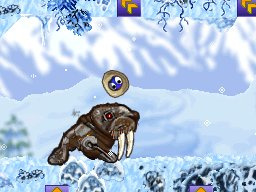 It's up to you to press the action button or the touchscreen at the right moment to grab hold of Joe or use the current to move him around the many platforms and hazards you'll encounter. You'll even get to face off against a boss at the end of each area, although these fights still use most of the same basic gameplay elements. To further add a little depth to the experience, the game presents you with a wide variety of power-ups to make things a bit easier. These range from a protective shield to various magnetic goodies that can change the polarity of the magnetisers and reverse gravity for short periods of time. There's even a really cool jet pack that you can control using the d-pad to more easily and efficiently guide Joe around. You'll find that these power-ups are quite necessary in successfully navigating some of the more treacherous levels you'll run into later on. The single player mode presents you with several ways to experience the game. Story allows you to play level by level with ever-increasing difficulty as you make your way through the adventure. As you unlock worlds and individual levels, you'll also be able to tackle the Scenario Mode where you can choose to go back and experience stages with a unique twist or two added. These include playing the area as a collect-a-thon or trying to beat it within a strict time limit. While these bonus modes might seem a bit like the developers were reaching, they actually do create a nice spin on the regular Story Mode. If you've got a friend on hand who also owns the game, you can enjoy a little multiplayer action racing each other to the end of each level. You'll even be able to choose whether you want to use the standard magnetisers or take control of the more free-flowing jet pack instead; both ways are fairly enjoyable, and at times even outperform Story Mode in terms of fun. The game's unique control system smacks of originality, but its execution isn't quite as solid as needed for a game of this nature. 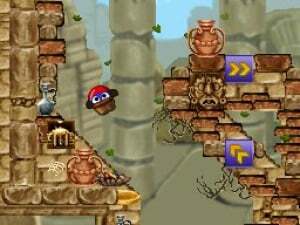 So many times you'll end up grabbing onto the wrong magnetisers and getting flung off in the wrong direction, generally into a hazard that will cause you to end up restarting the level. And, to add insult to injury, the duration between you losing your life and getting back to the start of the level is fairly significant thanks to some rather lengthy load times and pauses around the Retry menu. When you couple all of this together, it sadly ends up making the experience far more frustrating than fun, especially pacing is important to your playing experience. There are some extremely well designed and colourful visuals to behold, some extremely impressive even by 2D DS standards. There's also a lot of variety between the various areas, so you'll never find yourself at a loss for new scenery to enjoy. The music features some impressive moments, but lacks the same type of variety found in the game's visual presentation. The only downside is that the captivating audio/visual performance will leave you wishing the developers had spent as much time on the gameplay system as they did here. 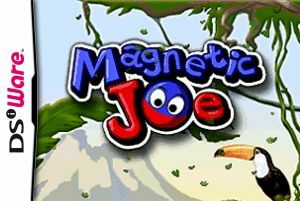 There's no question that Magnetic Joe will appeal to some gamers who can view the somewhat sloppy controls as part of the game's unique challenge. Of course, for those who've experienced some of the better ball-rolling titles that have come after it, it will most likely end up as a far more tedious experience than the unique and enjoyable one it was five years ago. Perhaps it's time for the developers to go back to the drawing board and tighten things up a bit, because Magnetic Joe has lost a lot of its original magnetism. About what I expected. I was just looking for another DSiWare game to download, but I think I will stick to getting one of the better games on DSiWare that I haven't gotten yet. Another game I enjoyed that this reviewer didn't. I've learned to ignore his opinion. Guess with my pedestrian tastes I'm not as much an expert on balls as Mr Dillard. I've learned to ignore his opinion. I'm not sure you have.